puts unreasonable strain on the global trading system. To offset such surpluses and sustain enough aggregate demand to keep people in work, the rest of the world must borrow and spend with equal abandon. In some countries, notably Italy, Greece and Spain, persistent deficits eventually led to crises. Let’s put the notion that somehow trade deficits caused the Great Recession aside, and focus on the deficits themselves (for a more correct outline of the Great Recession, see Salerno's 2012 article). First off, the argument here is completely backwards: surplus countries don’t ramp up surpluses and then somehow force deficits on others (let alone producing crises). Rather, they are the residual outcome of millions of individually-beneficial (and fully-funded!) outcomes. To argue that such outcomes are harmful or damaging is not only economically false but a fallacy of composition: what’s good for every individual transaction can in no way be bad for the entire system. Secondly, the aggregate rather than the individual view here is misleading at best, harmful at worst. No Spaniard or Italian has to buy German machinery simply because Germany’s “surpluses” forced him to; he does so because he believes those products best serve his consumption or production aims, allowing him to derive benefit from them. think about it in terms of money. Remember that all of these transactions have to be reduced to a common denominator, namely market prices measured in some currency. So to say that the United States is running a trade deficit with the rest of the world means that we are spending more dollars on foreigners' stuff, than the dollar value these foreigners are willing to spend on American output. Hence, the rest-of-the-world gets a growing stockpile of dollar bills. Now whatever the rest-of-the-world does with this net growth in dollar bills, it constitutes an investment in dollar-denominated assets. If they simply hold them as cash, that counts because the dollar is, well, a dollar-denominated asset. Or (the more likely scenario) the foreigners will use their gain in dollars to buy US assets, such as bonds from Uncle Sam or shares of American corporations. 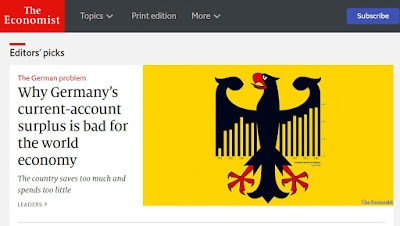 Moreover, delving down into the statistics themselves, the story that The Economist is telling is not even factually true; while Germany is running a comparatively large budget surplus to the tune of €252 billion last year (roughly $300 billion), those surpluses are not accruing from trade with its Southern European peers as one would think after reading The Economist's story. Its biggest current account surplus occurs from trade with the UK (€50bn), the US (€49bn) and France (€36bn), countries that may be suffering economically, but hardly the recent basket-case catastrophies of Southern Europe. In fact, among its biggest between-country surplus relative to size of that country’s economy is Sweden which last year had an €11bn deficit in trade with Germany equal to almost 2.5% of that country’s GDP. The surplus trade with Italy (0.58% of Italian GDP), Spain (1% of Spanish GDP) or Greece (1.8% of Greek GDP) as The Economist is so concerned about is much smaller. At the other end of that same list among countries that have surplus in their trade with Germany we too find relatively well-performing countries (China, Netherlands, Norway) whereas the only countries whose trade are in roughly in balance in their trade with Germany are among the poorest countries in the world (Zimbabwe allegedly has a €35 million trade deficit with Germany) [Trade statistics from German Federal Statistics Office; GDP statistics from Eurostat]. Germany has plenty of worthwhile projects to spend money on. Its school buildings and roads are crumbling, because of the squeeze on public investment required to meet its own misguided fiscal rules. [...] Greater provision of after-school care by the state would let more mothers work full-time, in an economy where women’s participation is low. Next up: hoarding. Contrary to the story implied by The Economist’s editors, there is nothing wrong with the idea that Germans are simply stacking up piles of Euro-notes for no good reason; hoarding is perfectly fine, even beneficial for the economy insofar as it reduces prices compared to what they otherwise would have been. But even that story is mistaken, since the Germans are increasingly using those surpluses to buy property in the Mediterranean area, especially in Spain. In fact, as Mises and many others before him has taught us, every trade deficit is matched by a capital surplus; people don’t give away goods for free, and so the fact that the rest of the world buys more German goods than Germans buy from the rest of the world, means that Germans end up with foreign-denominated assets, such as dollars or houses or stocks and government bonds. We can further illustrate the absurdity of the entire current-account/trade-deficit argument by the following example: imagine that Spaniards rather than selling the property titles to Germans as they are, could somehow package those coveted Mediterranean houses into small boxes and ship them off to the very same Germans in Germany. The exact same transactions would take place (Spanish houses for German money) but the second scenario would, to The Economist’s economically illiterate delight, increase Spanish exports and German imports, hence reducing Germany’s trade surplus. Nothing would change in essence, but German's current account surplus would seem smaller and so “more sensible”. An economic doctrine doesn’t get more preposterous than this. As Mises says “The credit side and the debit side are always equal. The balance is always in balance.” (Human Action, p. 447); James Wilson would turn over in his grave had he known what his modern followers has done to his free-trade magazine.